Match cards and gems to discover an astounding treasure. "I love this game! It really is addictive. I have many games on my kindle, my PC and my tablet. Most of them are there because my grandchildren and/or my great grands use my kindle to play them. I have no problem when this happens. They do not take advantage of this old lady. But then they put Jewel Quest on my kindle and I was hooked. Try it and you will understand." When Ratu, a close friend of Jewel Quest heroes Emma and Rupert, uncovers a mysterious tablet buried in the ruins of an ancient civilization, he is suddenly thrust into a deadly game of cat-and-mouse with a dangerous gang of thugs. Help Ratu defeat his foes and discover an astounding treasure by matching cards in gripping solitaire layouts and matching gems in challenging Jewel Quest boards. I like both the Jewel Quest series and solitaire games . 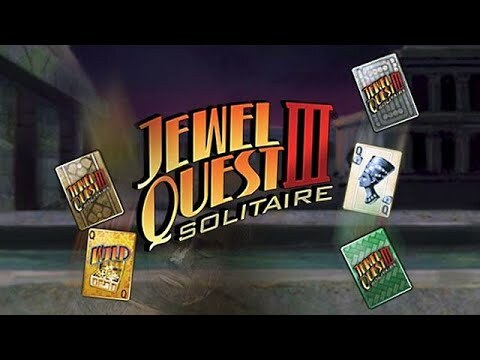 Jewel Quest Solitaire 3 is a mix of your standard Jewel Quest match-3 gameplay and solitaire. It's great to have 2 of my favorite game types in the same game. I have been playing this game for a long time on another computer. It's fun, easy to play, and I can quit anytime and come back to it. Even though I've played it many times, It's still challenging. I have played this game for years, but couldn't install from my CD I had previously bought. I bought it from GameFools and am enjoying it again. Cheers to the creator of Jewel Quest 3. It is fun, challenging, and has an interesting end game. I also enjoyed the story line. It keeps me spellbound. I love solitaire. I love match 3 games. I love jigsaw puzzles. Can't ask for more. We like the game very much and are very thankful to have it back again. My husband has Alzheimer's and he enjoys playing the game and it is good for his memory. Thank you very much for keeping the game in the archives. I bought this game for my wife. She loves it and has played it every day for months. The graphics are beautiful and she loves the combo of cards and jewels. Thank you so much! Can't stop playing Jewel Quest Solitaire 3. Easy to install and play. No viruses. Glad to purchase without any worries.